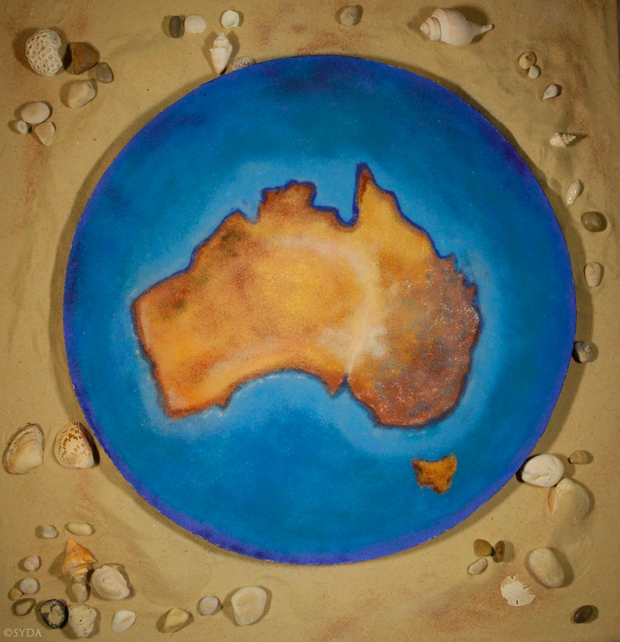 When I first looked at this rangoli, I saw the geographical context of Australia, its landmass surrounded by water and beautiful beaches and great central deserts. One continent. One country. Then, as I looked closer, I felt in my heart that Australia was sitting in the blue of Consciousness; that, throughout the Chanting Tour, the country was being held so tenderly by the Guru’s grace and gracious presence. Uluru was at the center, reflecting all the love, focus, and generosity of spirit of the satsangs so far. For me to see the whole country granted such a privilege, and to see the joy in its response, has been an absolute delight. Thank you, Gurumayi, for the opportunity to share in the joy you so generously and continuously give to everyone in this world.